A varied group of plants, in general Dianthus are easy care, and widely grown, best known for types such as 'Sweet Williams', Carnations 'Pinks', 'Clove Pinks' and 'Cheddar Pinks'. And as for the common name of 'Pinks', it is to do with the edges of the flowers themselves, they look as though they have been cut with a pair of 'pinking shears'. 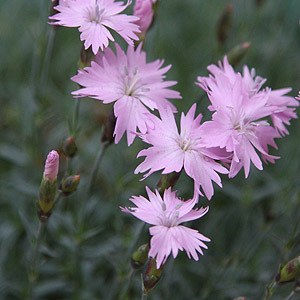 Dianthus are popular for the sweetly fragrant flowers as well as the foliage. 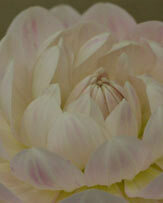 The longer stemmed varieties are also a wonderful cut flower and the others are great for vases and posies. So what is the difference between them. 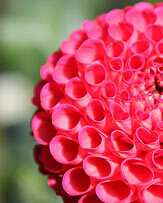 Carnations are bred for the cut flower industry, they tend to be a little more fussy than most. The 'Cheddar pinks' are the really hardy types, excellent in the cottage garden, rock garden or in a container. 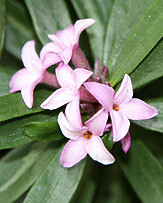 And the 'Sweet Williams' or 'Pinks' are usually treated as a biennial, unless you live in a warmer climate. Specialist Dianthus nurseries can supply by mail order Dianthus or "Garden Pinks", these are a perennial plant used widely in garden borders. 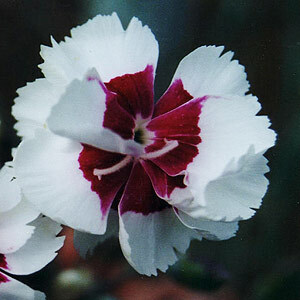 Dianthus caryophyllus hybrids are the Sim Carnations. The Pinks, or Sweet Williams are Dianthus barbatus, this is a large genus with well over 300 different species, of dianthus the variety available is huge. 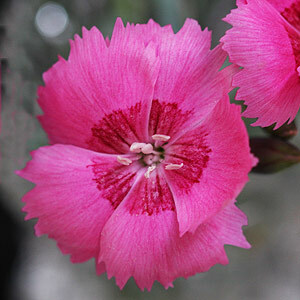 Dianthus caryophyllus (Clove Pink) is a Dianthus species from the Mediterranean, fragrant, drought and heat tolerant. Dianthus gratianopolitanus or 'Cheddar Pinks' (see picture right) are similar. Plant in spring or autumn in a sunny position. A humus rich moist but well drained soil is essential, Dianthus all require good drainage. A major problem with Dianthus is soggy or wet soils during winter months. We like to apply some well rotted compost in spring and a little mulch in early summer to help retain moisture. 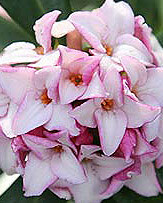 Spent flower heads can be pruned away to encourage a second flush of flowers. As winter comes and the first frosts appear plants can be cut back to just above ground level. Established clumps can be divided every 4 - 5 years. Dianthus plumarus also known as 'Pinks ' have been grown for many years and need little introduction, other Dianthus species are worth exploring. Dianthus petraeus is an interesting species, low growing and mat-forming with needle like foliage. Small fragrant flowers in summer. Dianthus Averiensis is an alpine species with a nice fragrance. Includes: Tuberous Begonias. Young plants specialists. Growing Fuchsias, Geraniums, Patio Plants and Plug Plants. One of the best selections available in the UK direct from the grower! 'Our aim at Halcyon Plants is to provide a varied and reliable range of great garden plants and good value plant seeds to buy online.' Lavender, Bamboo, Shrubs, Perennials, Crocosmia, Lily, Potentilla, Plant Seed, Iris, Hemerocallis, Hardy Fuchsia, Hardy Geranium, Herbs, Dianthus, Hosta, Phormiums, Penstemon,Heuchera, Potentilla, Cistus. Unusual, rare and cottage garden plants. 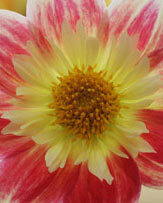 Extensive seed lists, also plants for sale. Specialist in aquilegias (granny's bonnets, columbines); including coloured leaf forms, scented ones and red and yellow doubles.